The Republic of Kalmykia (a federal subject of Russia), the only Buddhist nation in Europe. The Kalmyk people are the only people of Europe whose national religion is Buddhism. They live in Kalmykia, a federal subject of the Russian Federation. 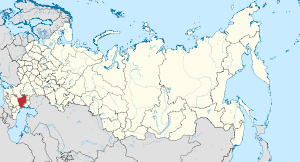 It borders Dagestan to the south, Stavropol Krai to the southwest, Rostov Oblast to the west, Volgograd Oblast to the northwest and Astrakhan Oblast to the east. The Caspian Sea borders Kalmykia to the southeast. The Kalmyks are the descendants of Oirats who migrated to Europe during the early part of the 17th century. As Tibetan Buddhists, the Kalmyks regard the Dalai Lama as their spiritual leader. The Šajin Lama (Supreme Lama) of the Kalmyks is Erdne Ombadykow, a Philadelphia-born man of Kalmykian origin who was brought up as a Buddhist monk in a Tibetan monastery in India from the age of seven and who was recognized by the Dalai Lama as the reincarnation of the Buddhist saint Telo Rinpoche. Ombdaykow divides his time between living in Colorado and living in Kalmykia. Kalmyk political refugees opened the first Buddhist temple in Central Europe, located in Belgrade, Serbia, in the 1920s. Many of their offspring relocated to the United States in late 1951 and early 1952, where they established several Kalmyk Buddhist temples in Monmouth County, New Jersey and its environs. 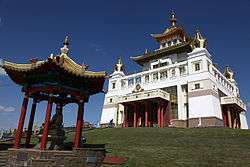 Ngawang Wangyal, a Kalmyk Buddhist monk, established the Tibetan Buddhist Learning Center and monastery in Washington, New Jersey. ↑ "Regions and territories: Kalmykia". BBC News. 2010-06-09. Retrieved 2010-10-11. 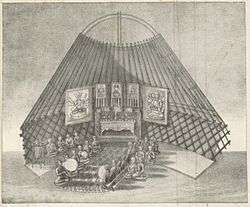 Wikimedia Commons has media related to Buddhism in Kalmykia.